ONLINE BOOKING DISABLED - CALL FOR AVAIBILITY & RESERVATIONS AT OUR 6,000 Sq Ft FACILITY - 541-647-4433 - 9' 9" Stand Up Paddle Boards are for speed and maneuverability on any of many local lakes and the Deschutes River. Paddle down with current, or paddle up river. Leash provided on request. Bow open storage area. Three fin system for extra control. May add seat at no charge on request. Recommended maximum novice weight ; 149 Pounds. For weights in excess of this load recommendation, we have SUPs rated up to 352 pounds (SPK-4 & Racing Board). An inflatable SUP board is a great choice if you are looking for convenience and portability. 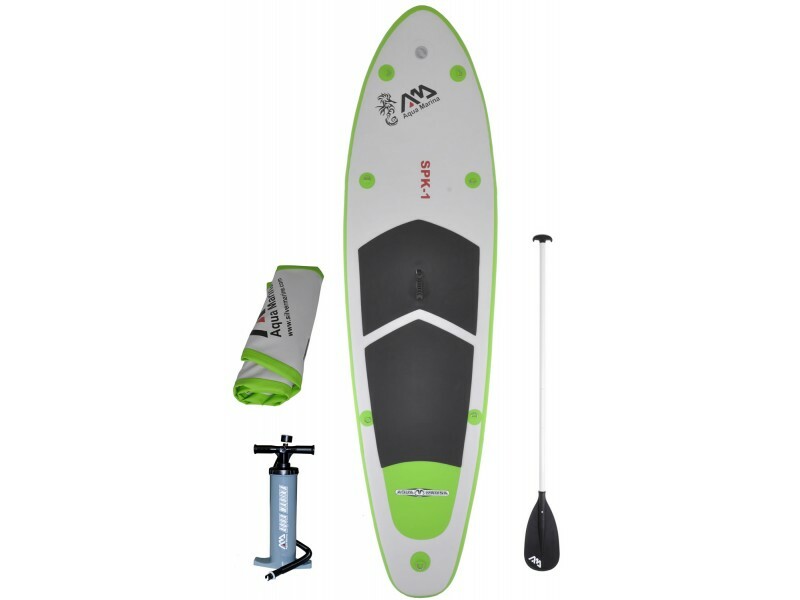 The Aqua Marina SPK-1 Inflatable SUP Stand Up Paddle Board and 3PC w/Paddle 9' 9" is lightweight, durable, and fun to paddle! It has a tri-fin set up and the 7 stainless steel D-rings and elastic bungie cords will help keep cargo in reach. The PVC construction is commercial grade and super strong. The anti-slip deck pad is large and will help keep you upright. This inflatable SUP board has a similar feel to a hard SUP board and when inflated measures 9'9" long, 30" wide and 4" thick. Fold the SPK-1, collapse its adjustable paddle, and put everything in the handy carry bag, or put in the trunk to return it to ToyHouse.. Pick up as early as 9am - Return by 5pm same day or 9am the following day. Multi-day rental rate available. Have SHARC Recreation Plus Passes? Your SHARC passes also provide you with access to the new SROA Boat Launch to park your car and exit/enter the river at No Charge (Day passes not accepted) – Owners and Renters must be in possession of a current SROA Recreation Plus Pass (or SROA Owner's Card) to open the gate, enter the water and exit the water from the marina. Leave one car at the marina and bring the whole tribe to ToyHouse – we'll get everyone vested and supply access to transport your rentals to Harper Bridge (or other selected put-in) for your float. ToyHouse can not pick up equipment at the SROA Boat Launch. This is a really great 3 hour paddle (5+ hour float). Come directly to ToyHouse and we load all your equipment for the put-in trip. Taking a Day at The Lake? Elk Lake Resort has music (and food service) every Saturday Night through the Summer. So you can spend the day at the lake and end your great day with music and dinner overlooking the lake. We have all sorts of water play toys for a fun day at one of the many lakes nearby. There are floating islands, tubes, water toys, kayaks, canoes, SUPs and so much more to make your day at the lake a memorable one. 12V pumps available for on-site inflation of inflatable toys.